The cottage is beautifully furnished, great attention to detail has been put into the decoration of each room and all the furniture is of excellent quality. On entering the Cottage the front door leads to entrance lobby with access to the large garage providing secure parking for one car plus ample storage for bikes, pushchairs etc. It also has a utility area with sink and additional storage space. The back door leads to a paved patio area with garden furniture. Stairs from the entrance lobby lead to the first floor landing. From the landing a door leads to the open plan living area. There is a good sized, comfortable lounge with two settees, TV, and various pictures of Lakeland fells. A selection of tourist information, Lake District magazines and books are in the living room cupboard. Alongside the lounge is the beautiful newly fitted kitchen and dining area, with all the modern facilities as you would expect from your kitchen at home, so whether you eat out every night or stay in and play Gordon Ramsay, we are sure you will find everything you need. There is an electric oven with gas hob, microwave, large fridge freezer, dishwasher, and plenty of cupboard space, plus lovely views towards Latrigg & Skiddaw. The dining area has a pine table and chairs. The second floor has two bedrooms, one double and one large twin bedroom, both bedrooms have quality mattresses & excellent bed linen for a comfortable nights sleep, bedside cabinets, wall lights, clock radios and built in wardrobes with ample hanging room and shelf space. Towels are provided. Also on the second floor is the brand new modern shower room with large walk in shower, WC and hand basin. Byways sleeps up to 4, with one double room and one twin. There is a lovely cosy feel to this property, which is set in a quiet area. There is a landscaped patio to the side of the house which offers a great place to sit. Also perfect for those holidaying with their dog, as the property accepts pets by prior arrangement. Byways is presented to a high standard being graded 4 Star. Byways is a traditional Lakeland end of terrace set in a quiet area within a 5 minute walk to the centre of Keswick. There is a very welcoming feel to this property. The landscaped garden and patio area to the side offers a great place for those wishing to dine alfresco, or bring your dog as the cottage accepts pets by arrangement. As you enter the cottage you walk directly into the spacious open plan lounge and dining area with wooden floors, dining table with 4 chairs, two sofas and the lovely gas burning stove which makes for a great feature in the lounge. This room gives a really inviting feel making it a real home from home. The kitchen is well equipped with oven & hob, dishwasher, washer / dryer, fridge freezer etc. Upstairs there are two pretty bedrooms. To the back of the cottage is a double bedroom and a larger twin room to the front. Both rooms are well furnished. The bathroom has a corner bath with shower over, WC and wash hand basin. Parking is on street directly in front of the cottage. Pets are welcome by arrangement. A pack of towels (bath sheet, bath towel and hand towel) are provided per bedroom. The property has been tastefully decorated and recently totally refurbished to provide fresh and immaculately clean accommodation for up to 4. All furnishings are of excellent quality. ‘Blencathra’ has ample parking, full double glazing and gas central heating. All radiators can be individually thermostatically controlled. The bungalow is situated at the top of a small, quiet cul-de-sac. It has a westerly aspect and the fells from Coledale, across Whinlatter Forest to Barf and Skiddaw make a spectacular panorama to the front. At the rear of the property there is a spacious garden providing a peaceful, leafy green area in which to relax and enjoy views of Skiddaw and Latrigg. Red squirrels are charming, frequent visitors. Patio furniture is provided for the summer months so guests can make the most of the tranquillity. To the left of the front door is the comfortable lounge with outstanding westerly views. Furnished with a leather suite, colour television, DVD and living flame gas fire it is warm and cosy at any time of the year. The superb double glazed conservatory at the rear of the bungalow provides a quiet and peaceful additional space in which to relax. The kitchen/diner has very well equipped quality wooden units, an electric oven with a gas hob, extractor fan, washer/dryer, CD/radio and a larder fridge. The freezer is located in the garage which is also a useful area for drying wet clothes - and sorting out walking boots! 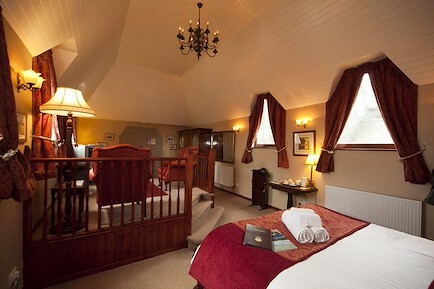 Bedrooms – a double and a twin room, both having comfortable beds and quality pine furniture. One bath & one hand towel per person is supplied. Located in Keswick just minutes walk from the town centre. Your enquiry will be sent directly to Alison's View, Byways and Blencathra. Please fill in as much detail as you can.